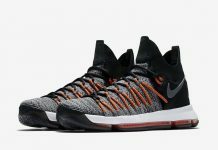 Next up for Kevin Durant’s postseason Nike KD 9 is this Nike KD 9 Elite Multicolor colorway. This release is expected to debut towards the end of April. Dressed in a Multi-Color, Black and Volt color scheme. This Nike KD 9 Elite features a full Nike Flyknit upper covered in Rainbow colors while having a Black heel and ankle collar. Its Zoom midsole is done in Volt that rests atop a solid Black rubber outsole. Look for the Nike KD 9 Elite “Multicolor” to release on April 28th at select Nike Basketball retailers and Nike.com. The retail price tag is set at $150 USD.